The great thing about Indian Cuisine is its mind-boggling variety. That’s why every time I enter an Indian restaurant in the United States; it’s disappointing to see the same stale names on the menu again and again. Making it worse are the sub standard ingredients and the tasteless frozen vegetables along with the overcooked meat that’s used. Of course there are exceptions I’m sure. I just haven’t come across any of those exceptions. No wonder a large number of people think Indian food is spicy, greasy and rich. Well… if we did eat like that, we would have keeled over and become extinct by now. 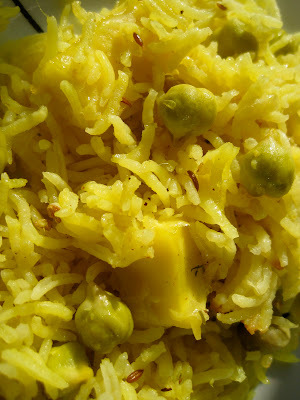 In the meantime here is a super simple recipe for Fresh Green Chana (Garbanzo Beans/ Chickpeas/ Hare Chana) Pulav. I kept everything very simple to let the freshness of the green chana come through. Fresh green chana is very tender and requires much less cooking than the dried variety. It is sold in its pod and needs to be shelled, just like peas. Although the process of shelling the chana can be tedious, it is definitely worth giving a shot! Heat oil in a kadai or heavy bottomed pan. Add in jeera, cardamom, clove and bay leaf. Allow the cumin to start spluttering. If using an onion, then add it in now. Sauté till translucent. Otherwise add in the chickpeas, chopped mint, kasoori methi, salt and pepper. Sauté for a few minutes. Then add in your paneer. Stir once to mix. Then add the rice, water and coconut milk. Combine well. I used a rice cooker and hence I transferred it all to the rice cooker. Once it is done, garnish with the coriander and cashews. Add a squeeze of lime before serving. Once you add the lime, do not reheat the rice. Sometimes limejuice can taste bitter up on heating. Using a rice cooker is not a must. Go ahead and use whatever means you use to cook rice and adjust the water accordingly. I normally use 3 cups of water but I reduced it to 2 ½ cups since I also added ¼ cup of coconut milk. Using Paneer is optional and was more a personal preference. I normally make my own paneer using low fat milk to save on calories. I save the ghee-fried cashews for special occasions! It’s too much of an indulgence for everyday!